A mix of modernity and tradition: this is the only way to Dubai to experience authentically, as we visit places you would never experience on a group tour with many other participants. Discover one of the best holiday destinations in the world on a private city tour of Dubai, without stress or language difficulties. See more Let yourself be dazzled by the fastest growing city in the world with its stunning skyline. After this tour, you are perfectly prepared for the remaining days of vacation. The city tour of Dubai begins with a drive to the famous, artificially constructed island Palm Jumeirah. We will head along the trunk with a length of 4 km and from there we will be able to get a view over the 16 Palm leaves with their numerous private villas. We will travel through the 800-meter-long undersea tunnel and reach the outer ring with a length of 12 km, home to the luxury resort Atlantis - The Palm Jumeirah. During the photo stop, you will be able to take some breathtaking pictures of the Atlantis - The Palm Jumeirah. The journey continues to the Dubai Marina, an exclusive area for housing, leisure and commercial activities. Here you can enjoy a brief stroll along the waterfront and marvel at marina harbour, set amidst the new Skyline with more than 260 skyscrapers. Stroll through Madinat Jumeirah, the "Little Venice of Dubai", which was built wwith the utmost attention to detail, representing a lagoon city in the style of old Arab palaces with the typical wind towers. It is filled with waterways of a total length of 3.7 km, over which Abras (water taxis) glide to take visitors to their hotel or villa. Stroll through the colorful and vibrant Souk Madinat in a scenic ambiance of Arabian style. Get lost in the winding alleys and enjoy the bazaar-like atmosphere with its wide open shutters and intimate galleries, the sounds of craftsmen at work and the aroma of the street cafes and boutique restaurants. 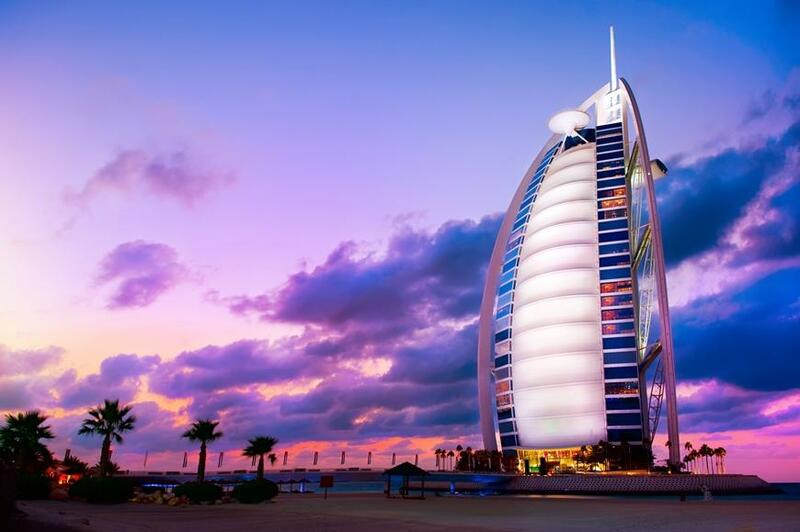 From here you can enjoy a fantastic view over the 7 * luxury hotel Burj Al Arab, and capture it for eternity with a photo. Then we will head towards the Spice Market, where you can entice your senses in the oriental fragrances and smells. On the way there is also the Gold Souk, the Gold market. From there you will have an impressive view over the Dubai Creek. We will continue our journey with a water taxi across the Dubai creek. Aboard the Abras, the traditional wooden boats, you can admire the skyline of the old and new Dubai from the water. Then we will head to the Dubai Mall, one of the largest malls in the world and visit another highlight - the Dubai Mall Aquarium. Marvel at more than 33,000 sea creatures in over 10 million liters of water behind the largest acrylic glass panel in the world and dive into the fascinating underwater world. As the absolute highlight of your personal city tour, you will visit the Burj Khalifa, the tallest building in the world with a height of 828 meters. It is located right next to the Dubai Mall, one of the largest shopping centers in the world with 1,200 stores. Visit the observation deck in a height of about 452 meters. The building’s express elevator ascends at a speed of 10 meters per second to the 124th floor. From there you will have a marvelous 360º panoramic view over the whole of Dubai with its unique skyline. After the tour you have the option, to look at the Dubai Mall, the largest mall in the world at your leisure. Enjoy lunch or dinner or just go on a shopping tour. 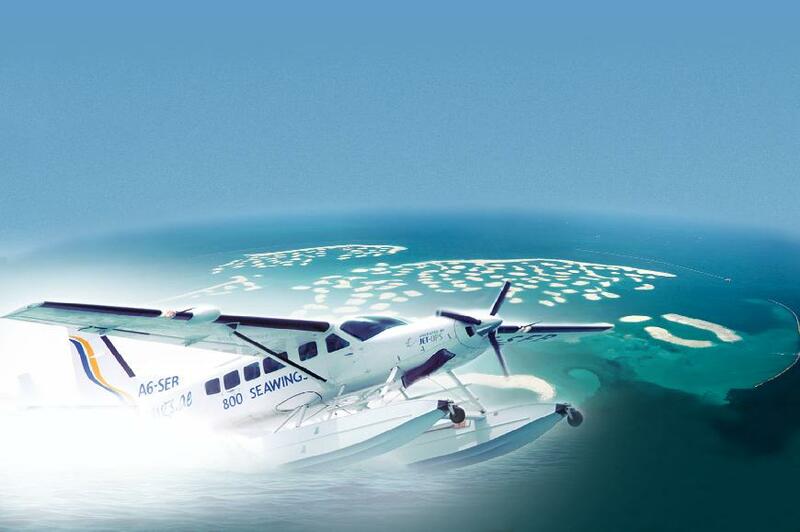 • This is a private and exclusive Dubai tour with the top highlights of the city of superlatives, where you can experience the historic and modern Dubai and freely express your wishes. • The Dubai Fountains show starts from 18:00, and then plays every half hour until 23:00. • The tour ends in the Dubai Mall - the main entrance of the Burj Khalifa. • Please note that we can only offer the tour with a minimum charge of 2 adults price. • Please have a little patience. 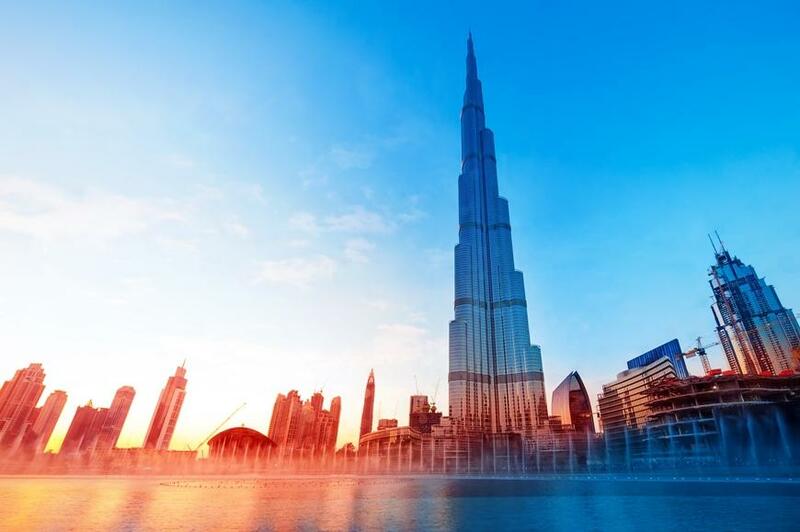 Due to the large number of visitors, there can be queues at the entrance of the Burj Khalifa during high season and on special occasions like Christmas, New Year, school holidays, as demand and interest in the world's tallest building are particularly high during these times. This tour may be canceled free of charge up to 3 days before the start of the tour. Wir hatten einen schönen Tag mit Mohammed. Haben viele Informationen über Dubai bekommen und konnten alles was uns interessiert nachfragen! Das Aquarium war der Hammer. Der Burja war toll und gigantisch mit der Aussicht, aber das Drumherum war schrecklich. Aber alles in Allem eine sehr gelungene Tour!! Vielen Dank! Die Organisation und der Kontakt mit Ramy war super!!! Dankeschön an Ramy für die unkomplizierte Buchung. Unser Guide war sehr pünktlich und super freundlich. Wir wurden sicher und kompetent durch Dubai geführt und gefahren. Wir hatten überall genügend Zeit uns alles in Ruhe anzuschauen. Leider war das Wetter etwas regnerisch an diesem Tag, so dass die Fahrt mit dem Wassertaxi leider ausfallen musste. Es war dennoch eine sehr gelungene und interessante Tour, die sehr zu empfehlen ist. Herzlichen Dank an Ramy für die Freundlichkeit und die unkomplizierte Buchung. Unser Guide war auch Super. War sehr kompetent. War unglaublich interessant und hat sehr gut italienisch gesprochen. Die Tour ist TOP und auch mit Kleinkindern sehr zu empfehlen. Für unseren ersten Tag in Dubai haben wir uns einen Überblick gewünscht und sind begeistert von der Tour: Mohamed hat uns pünktlich mit zusätzlichem Fahrer am Hotel abgeholt und die Highlights des alten und modernen Dubais gezeigt und ausführliche Erläuterungen gegeben. Zwischendurch hatten wir immer Gelegenheit, eine Zeit die Eindrücke wirken zu lassen und Fotos zu machen. Der Nachmittag war sehr bereichernd und in einer absolut freundlichen und angenehmen Atmosphäre. Wir sind sehr froh, uns für diese Tour entschieden zu haben und empfehlen diese unbedingt weiter. Ein wahnsinnig informativer Nachmittag/Abend in Dubai mit dem sehr sympathischen Kamal als Guide. Vielen Dank nochmal!!! Auch an Ramy, für den Kontakt vorab über Whatsapp. Sehr pünktliche Abholung am Kreuzfahrtterminal, wie verabredet. Alles super gelaufen. Werden euch auf jeden Fall weiter empfehlen.